Le Beau Monde, September 1808. The descriptions of prints in this magazine are generally extremely detailed and often filled with overly effusive language. Similar enthusiastic descriptions are regularly found in La Belle Assemblée, which was published by John Bell, who is thought to be the estranged father of the publisher of this magazine, John Browne Bell. Le Beau Monde was only published from 1806 to 1810. 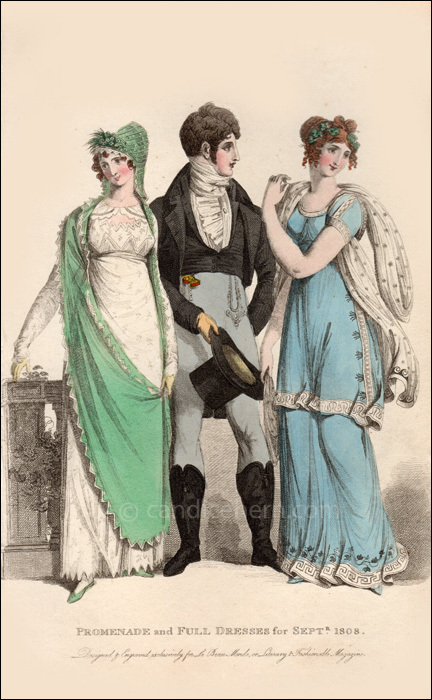 Beginning around 1810 in La Belle Assemblée, we begin to see the fulsome fashion descriptions, dominated by the designs of Mrs. Mary Ann Bell, who is mentioned in almost every issue, and who likely wrote the descriptions herself. No one quite knows how she may have been related to either Bell, father or son, though many suggest she may have been John Browne Bell’s wife. Whoever she was, she appears to have moved to the father’s publication once the son’s publication had folded. The ebullient style of the many of the fashion descriptions in Le Beau Monde certainly have a similar sound to those that were most likely written by Mrs. Bell for La Belle Assemblée. “Fig. No. 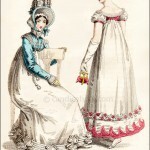 1.–Promenade Costume.–An Indian muslin dress, with flat satin springs, made high in the back, and brought in a horizontal line round the bosom; it has a hanging collar sewed on to the back and fastened in the front with an antique broach. 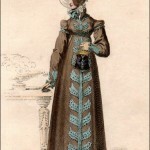 The sleeves are long and full á l’eveque, vandyked at the wrist, and the dress is also vandyked round the bottom, and in a double row round the waist. The hair is dressed in easy flowing curls, with a vandyked bandeau of fawn coloured satin, placed negligently over the left brow, and ornamented with a wreath of variegated flowers, interspersed with jessamine. Such is the costume at the breakfast table, but when preparing for the promenade, the library, or the race ground, the elegante calls for her Valencia cap and cloak; these two articles of dress are in one, and in a style novel and unique; the cap or hood, resembling in shape the cowl of the Order of St. Dominic, is of green lace net, worked with white stripes, with the collar coming on each side of the neck, to this is attached the cloak of green pelong satin, with a vandyke border, edged with narrow white point lace; the tout ensemble of this bizarre and romantic dress, gives a bewitching interest to the fair wearer, and pleases the fancies of the surrounding beaux in recollecting that although their fair companions wear the cowl, they have not yet taken the veil. Shoes high heeled, and of pea-green, the gloves are of straw coloured kid. Sadly, I don’t have a description of the gentleman’s ensemble. Though he is looking at the lady on the right, he is dressed in a style more appropriate to the lady on the left. Pantaloons and Hessian boots would have been worn for walking or riding, and not for evening wear.